Since 1985 Rooney's Plumbing service personnel are fully trained, experienced, and fully capable of handling the most demanding of projects, whether repairs or improvements. We use the latest in plumbing technology, including electronic leak detection, video cameras, jetters, and trenchless systems. With our electronic leak detection methods, we can find the exact source of the leak quickly, accurately, in a cost effective manor. Tests can be performed in either dry or wet conditions for a variety of situations. Used to survey and pinpoint stoppages. This allows us to directly target the problem and save you time and costs on repairs. We specialize in Trenchless Pipe Replacement. Rooney's Plumbing can replace your damaged pipes or sewage lines without digging up your yard, or destroying your patio, garage or other structures that might impede traditional methods of replacing pipes or sewage lines. With the latest Trenchless pipe replacement technology, you no longer need to worry about future leaks or roots growing in your pipes which create stoppages. This is a very cost effective solution for many situations, where removing the obstructing patio, garage or other structure is not a feasible option. Trenchless systems can be installed very quickly as well! A high powered jet stream of water can be used to quickly remove grease or other blockages. 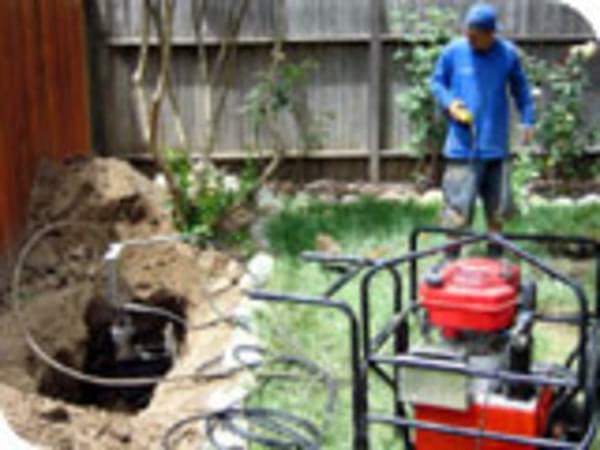 This eliminates the need to break ground and remove, replace or repair pipes that would otherwise not need maintenance.